This is a quotation from one of my fondest mentors this is a perfect description of what a sign Can be. stand out in a BIG way. ceate something so attractive we can get people to slow down or better yet stop. all the while advertising our business in the process. How cool would that be! THAT would be an effective sign! This piece is an interior sign for a gift shop in the lobby of Adventure Suites, A theme hotel here in North Conway NH. The door to this gift shop is an actual Vault Door. Sign dimensions are 24" tall X 42" wide x overall thickness of 6 1/2"
The black background is steel Diamond plate bent on an arch to protrude 4 " at the middle. 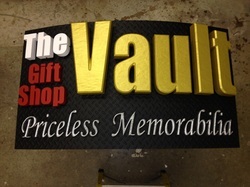 "The Vault" text is spaced off the back ground with the remaining text applied directly to the Diamond plate. All the Text is Designed and cut out of High Density Urethane Foam using Enroute Software and a Multicam CNC router. Then hand painted Using Modern Masters Paints.